With the launch of the MICHELIN Guide Switzerland 2019, Swiss gastronomy sees two new two-starred restaurants. With their straightforward and modern style of cooking, Patrick Mahler and his team from restaurant focus in Vitznau have landed in the guide, heading straight from zero to two stars. The second two-starred addition in Switzerland is chef Laurent Eperon's Pavillon located at the Zurich-based hotel, Baur au Lac. In total, the MICHELIN Guide Switzerland 2019 features a total of 128 starred restaurants, more than ever before. The three restaurants holding three stars in last year's edition—the Restaurant de l'Hôtel de Ville in Crissier, Schauenstein in Fürstenau and Cheval Blanc by Peter Knogl in Basel—have maintained their status and continue to represent Switzerland's crème de la crème. "The number of stars this year is proof of the high level and overall quality of Swiss gastronomy," says Gwendal Poullennec, international director of the MICHELIN Guides. "Our inspectors were very pleased to discover, and are very happy to share with our readers, an impressive variety of culinary styles, ranging from classic to modern and from Mediterranean to Asian cuisine." Together with focus and Pavillon, the total number of two-starred restaurants in the country has risen to 20. For the first time, the MICHELIN Guide recognizes more than 100 restaurants with one star in Switzerland—the 105 restaurants are spread all over the country, and among them, 21 have gained a star for the first time. With this geographical spread in mind, food lovers only need to travel short distances to dine at a Michelin-recommended restaurant, a unique feature of the Swiss culinary scene. Photo courtesy of L'Etoile - Nova. Among the newly-crowned one-starred restaurants are chef Alexandra Ziörjen's L'Etoile - Nova in Charmey, chef Bernadette Lisibach's Neue Blumenau in Lömmenschwil and chef Marie Robert's Café Suisse in Bex. K by Tim Raue, based at the legendary Hotel Kulm in St. Moritz, and heavily influenced by Asian cooking, also receives a star this year. Situated above Lake Lucerne—and only opening last year after nine years of construction—the Bürgenstock Resort in Obbürgen marks the most spectacular hotel opening of the year in Switzerland. Among its four hotels and a multitude of restaurants is Ritzcoffier, which inspectors immediately distinguished with one star. 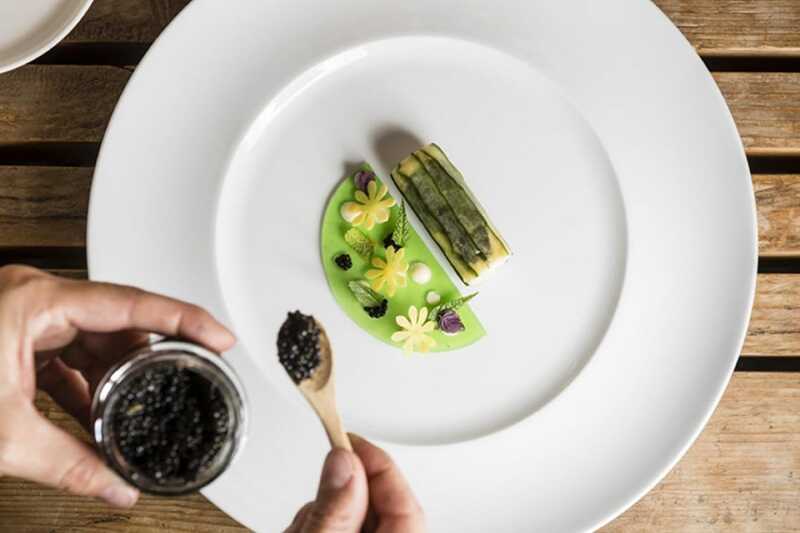 A first for the MICHELIN Guide Switzerland is the newly-starred restaurant Le Berceau des Sens, which belongs to L'École Hôtelière de Lausanne—the first time in the country that a culinary and hotel school restaurant has received such an accolade. The restaurant Belvoirpark, which belongs to the school Hotelfachschule Zürich, was designated with a Bib Gourmand for its outstanding value-for-money offer. Both awards confirm the excellent level of professional training in Switzerland, fueling top-level Swiss gastronomy by providing a new generation of well-trained and motivated chefs. Vitznau, based in an idyllic bay of Lake Lucerne, is evolving into a rewarding destination for gourmets. The village at the foot of the Rigi now boasts three starred restaurants: focus (two stars), Sens (one star) and PRISMA (one star). And there are more acclaimed restaurants nearby in the surrounding area. Some 15 years ago, Zurich had no starred restaurants. Now, the city boasts three two-starred and seven one-starred restaurants, three of which joined the Michelin family in the 2019 edition: Gustav, Ornellaia and 20/20 by Mövenpick. Congratulations to all restaurants. View the full selection here. Watch a livestream of the ceremony below.